LiveDrive online backup service has been around for quite a long time and continues to improve what they offer to their customers; so much so, that there is no other cloud backup solution review we have had to update as often. It used to be that he first thing that stands out about LiveDrive is that there are NO LIMITS to the Size of your backup files or the Bandwidth you are allowed to use to get to them; they have literally forced the competition to catch to them on this one so that now it’s not quite so rare. People continue to be attracted to LiveDrive, though, because you can backup unlimited data from one PC for a very low annual fee. The cloud service provided by LiveDrive is so popular that it attracted the attention, and a partnership with, a major UK based tech solutions website that launched LiveDrive KNOWHOW Cloud. LiveDrive only has two different packages for consumers and another two for businesses. For typical computer users, the first is just unlimited cloud backup (for a very low fee), and even with this basic service there are no limits on storage space, bandwidth, or transfer speed; though it is now been priced lower for just one computer. LiveDrive DOES backup a NAS device to the cloud also for an additional fee. Other distinctive features include version history that saves 30 previous versions of every file, apps for Apple & Android and a mobile website that should work for any mobile device. The mobile apps include STREAMING of movies and music, something not too many cloud storage services are offering yet. 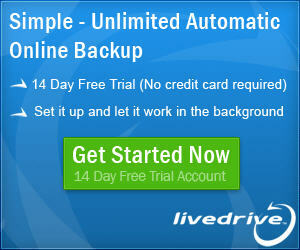 LiveDrive backup runs on Windows PC’s and Mac’s with the same desktop experience either way. Linux access can be done with SFTP fairly easily. The cool thing is, LiveDrive ‘backup version’ isn’t really priced any higher than a service like Mozy which for a long time was sort of the standard by which all others compare. Now with Mozy raising their price and limiting storage space it makes LiveDrive look real good by comparison. The LiveDrive Pro Suite cloud backup service is an expanded offering that allows 5 computers unlimited cloud backup plus the extras of the Briefcase option to sync files between your devices to the tune of 5TB! The upgraded version of LiveDrive includes a ‘briefcase’, which is a place online to keep the files you use most regularly. See the same files on every PC, and access these files online from anywhere. Livedrive Briefcase appears as a new drive (named L:) on your PC, so you can use it just like a normal drive. With this briefcase feature, there are even certain types of files you can edit online. Edit Office documents and retouch photos from your web browser from anywhere. Drag and drop pictures directly to and from Facebook, Flickr, SmugMug and more from our web portal. One-Click Sharing – Click to share files with anyone via a simple web link – or share files privately with friends, family and colleagues. No more e-mailing large files. Email to Livedrive – Email files straight to your Livedrive Briefcase as attachments. Easily upload files from mobile devices or other computers. FTP Support – Upload and download files from your Livedrive account using FTP. Supports FTP resume. Web Portal where you can see photos, watch videos, play music and display Office documents from your account. OK, we’ve looked at the good side, but like I said above – no online backup service is perfect, yet! Here are a couple of shortcomings that you might want to be aware of concerning LiveDrive for your online storage. The bottom line on this LiveDrive review is that the basic backup package is just flat out better than most every competitor. Even if you only have one computer, an online backup service that does not throttle bandwidth access or limit your online storage space is getting harder to come by.